BTW. Orogen Plus is a combination of PRP and a Matrix (yeah, a matrix). Four percent of all dermatologic visits in the USA are for Alopecia Areata, an autoimmune condition that causes patients to lose hair on their heads as well as on other parts of the body. Current treatment options are limited, and some of those options, like cortisone injections, have side effects. In contrast, infusing the patient’s own growth factors is completely safe and may prove to be an effective treatment regiment for this devastating condition. Both Dr. Greco and Mr. Brandt were awarded a 2007 research grant from the ISHRS to study the “Effects of Platelet Rich Plasma and Various Growth Factors on Non-Transplanted Miniaturized Hair,” and the study results will be published in 2008 International Hair Transplant Forum. I just spoke to Dr Greco Regarding updates on his PRP research. He told me he wasn’t able to attend the Montreal Conference, but he did finish his miniaturization study and it will be published in the International Forum in the next few months. Here’s the kicker… he said with great certainty that the combination of trauma and infusing Growth Factors did reverse miniaturization in the treatment group when compared to the control group. He also told me they received another larger grant to study the effects of growth factors in Alopecia Areata and they are in the process of treating both Alopecia Areata as well as Alopecia Totalis (which he said is a much more difficult type of Alopecia). In that study they will be utilizing their next generation of PRP (that includes our patented protein matrix). This will be a very interesting study. I do have a photo of a patient with AA at one year and one treatment which is quite impressive. Look at the photo below guys. Dr Greco did urge patience. He said that this is a step by step process to observe the results in various types of hair loss conditions. They have seen positive results in androgenic alopecia and also alopecia areata. He believes that the future of what they’re doing in conjunction with hair multiplication will be significant. I still have a lot of mini hairs… hurry up Greco!! » BTW. Orogen Plus is a combination of PRP and a Matrix (yeah, a matrix). » be published in 2008 International Hair Transplant Forum. This is what I meant when I proposed trying to raise money for hairloss research. Dr. Greco received a 10,000 dollar grant from the ISHRS…not alot of money. If each of our 16oo plus members contributed only 20 dollars, we would have raised over 3 times that amount of money…and then maybe we could be more involved in the research. » then maybe we could be more involved in the research. Will. Dr Greco told me they received a second, larger grant to pursue their PRP research. I didn’t ask him the value because it felt rude to do so; moreso, I don’t want to jeopardize my good standing with him. Regardless, I agree with you that it doesn’t take much money to tackle this problem provided one has a solid and efficient plan-of-attack (look at Dr Jones with Acell, or possibly PromoCell in the right hands for example). Unfortunately, the biggest hurdle collecting money on hairsite isn’t about the quantity of its members, it’s about their quality. There’s only a handful of guys with genuine interest to help us (and themselves in the process). BTW Will, I’m phishing for more info on Restoration Robotics hair transplant device right now. I’ll make a thread if I find anything worthwhile. is this a picture of androgenetic alopecia OR alopecia areata? It looks like full regrowth but that is heard of in alopecia areata cases already. I’d be really happy if this patient had androgenetic alopecia. » like full regrowth but that is heard of in alopecia areata cases already. » I’d be really happy if this patient had androgenetic alopecia. 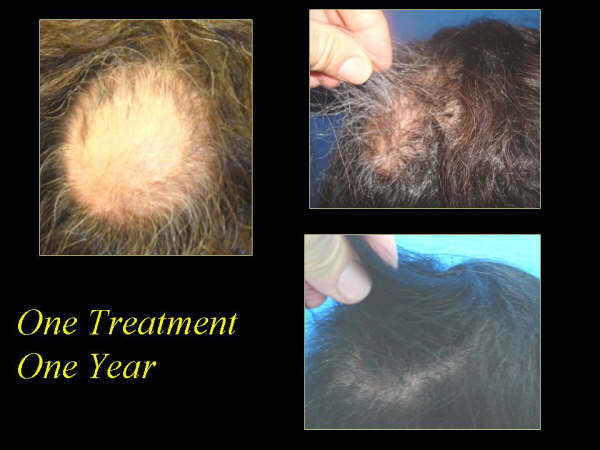 I just checked his website and the patient in the above picture was suffering from alopecia areata. Since the picture above is after a year, we have no certain way of knowing if the patient would have regrown those hairs naturally - without any treatment, because usually patient with alopecia areata do regrow hair after a while. » alopecia areata do regrow hair after a while. » » I’d be really happy if this patient had androgenetic alopecia. Arghh. you’re right… not only that but it was also a female patient (I wish Dr Greco mentioned that when we spoke). Having said that, Dr Greco is theorizing his PRP process turns-on the stem cells in the follicular-bulge. This has to be good for us as well. Alopecia Areata is an auto-immune disorder that causes patients to lose hair in various areas of their scalp and body. It can come and go, and the current treatment is a series of cortisone injections that may or may not work. This patient presented to a dermatologist 6 months prior to the before photo in (Fig 1), below left. The area expanded in a 2 cm circular area outward from the inner bald area on the before photo (Fig 1) when the patient was referred to OroGen. The patient had one session of PRP injections into her scalp and was growing hair at one month. In Fig 2 (below right) you can see that hair at six months is over 2 inches long with just one treatment. This is a very significant case study because this was the first case ever that PRP was use for this condition. Our theory is that the cytokines or proteins located on the platelets reduced the inflammatory effect of the T-cells. They “turned-on” the stem cells in the follicular-bulge that were dormant in the affected area, causing hair to begin to regrow. » » BTW. Orogen Plus is a combination of PRP and a Matrix (yeah, a matrix). » » this devastating condition. » » be published in 2008 International Hair Transplant Forum. Willy, I think you have a point here. We can build a website for raising money online from all those interested in tackling this condition, not only from this board but world wide, all they have to do is to make an online transaction, I m gonna prepare a thread soon about serious research that might offer us something. We have a diverse portfolio right now of research (Thank’s god).Things are progressing finally. We can select 2 or 3 most promising procedures. If 10.000 $ can make a difference then I’m sure we can make a bigger difference with our donations instead of crying all the time. (After all, this was the way Obama got to the White house, with volunteers and donations and Media). I think we need to have some kind of foundation in the US or Europe that is legally authorized to raise money and a good Communication strategy to ensure public awareness of the devastating effects of this condition so that we can push research forward through money and media. After all it’s not all about Aids and Cancer in the Medical Arena. There is already a US foundation (non-profit organization) for Hair loss , we need to contact it (its under the US medical society umbrella I think). But the question is the following , will we have some guys willing to volunteer and take the frontlines “vis a vis” the media and to handle the legal-daily management issues ??? » » » this devastating condition. » » » be published in 2008 International Hair Transplant Forum. » » then maybe we could be more involved in the research. » volunteers and donations and Media). Amilcar, I think that is a great idea. Unfortunately, I’ve brought this up a couple times before and most of the forum members “shot it down” rather quickly. This was discussed before ICX seemed to drop off and many said that they were so close to a cure that we would be wasting our time. Well, several years later, ICX is not showing much promise. Others claimed that we could not raise enough money to make a difference. Well, I’m pretty sure we could AT LEAST match a 10,000 grant between all of the members here. I actually had a few members here pledge significant amounts, but it never materialized. I feel this way…we’ve been comming here for many years hearing the same “5 years away” routine. Most of us are sick of it by now. This forum contains over 1600 members with a common goal. Why shouldn’t we work together to at least TRY to help ourselves? Furthermore, if we did raise a fair amount of money and some company actually brought a treatment/cure to market before we became involved…we could always give the money to some other cause where people are suffering! Or at least that is what I would want to do with it. Anyways, I really don’t think that this will ever happen. There are too many complacent people on this forum who would rather wait for others to solve their problem than to make ANY ATTEMPT to get involved. With as many people as we have here, that is ashame. With this many people, everyone could pitch in a LITTLE BIT (of time, money, effort, whatever) and we could get alot accomplished without any one person giving too much. If you really feel that you would like to get involved with something like this, I’m more than willing to do my part. its probably areata. I have seen even more impressive areata regrowths, Fron no hair what so ever to full head of hair again, no plasma cells necessary. yeah. Apparently they use cortisone injections, but they’re hit or miss on regrowth for areata disorders. In other words, this research is still significant, and we should know a little more about it in a few months when Dr Greco releases his next paper. » said that they were so close to a cure that we would be wasting our time. » amounts, but it never materialized. » would want to do with it. » get alot accomplished without any one person giving too much. » this, I’m more than willing to do my part. Ok, supposing over the next couple of days i set up a website that people could contribute to in terms of information and that would allow people to pledge money. Do you think anyone would? It would be very hard convincing people it was not a fake! And then we would have to decide who the money was going to! Follica, Intercytex, a new up and coming organisation? I might just do it anyway and see what happens! » » amounts, but it never materialized. » » would want to do with it. » » get alot accomplished without any one person giving too much. » » this, I’m more than willing to do my part. » pledge money. Do you think anyone would? » up and coming organisation? » I might just do it anyway and see what happens! Honestly, I doubt there would be much cooperation with this, but it’s worth a try. I wish that (with 1600 members) the people here would contribute their talents to accomplish something like this. I would bet (and no, I’m not sure) that there are people from various professions (attorneys, accounts, website developers, ect) here that could start something like this (not to mention financial donations from 1600 people). » something like this (not to mention financial donations from 1600 people). We’d have to ask hairsite if he’d be willing to hold the collections; honestly, he’s the only one we could trust with our money. We would require a thread/ serious discussion everytime contributors want to dispense the funds. » honestly, he’s the only one we could trust with our money. » want to dispense the funds. I don’t know much about this stuff, but couldn’t we set up an escrow account in some non-profit’s name so that the money could only be used for the purpose that it was raised for. Again, I don’t claim to be knowledgable about this stuff…that’s why we would need an accountant. Exactly, and accountants cost money. If you want this to work than you’ll need to simplify the process. That means no lawyers or accountants. That means we need to work with what be have: a somewhat decent forum along with a few guys willing to contribute a few bucks, and discuss who should get them. We’re not going to collect a million dollars to warrant a heavy infrastructure. Honestly Will, we need low-tech solutions to high-tech problems.